Approximately 3,000 rats were kept in special chambers where they were exposed to intermittent radiation – 10 minutes on and 10 minutes off for nine hours each day – from the womb until they were two years old (equivalent to a 70-year-human). The research confirmed that six percent of the rats went on to develop heart and brain tumors, while none of the control rats who were not exposed to radiation did so. Strangely, the radiation-exposed rats lived longer than usual, but the study authors believe that this was only because the radiation helped decrease chronic kidney problems which older rats are usually susceptible to. If the radiation exposure was spread out across the rats’ whole bodies but they still went on to develop heart and brain tumors, would humans who hold their cell phones against their heads all day long be more or less likely to develop brain tumors? Cell phones emit a dangerous form of electromagnetic radiation which is absorbed by the tissues and cells that come into close contact with the phone. For most people that would be the cells of the head and neck. It is logical that long-term, chronic exposure to this type of radiation would be at least as damaging to humans as it proved to be for the rats in the study. And this was by no means the only study to join the dots between cell phone radiation and cancer. Use a hands-free headset or talk on speakerphone. Keep your phone away from your body and head, preferably at an arm’s distance, when you’re using it. This is especially important when your cell signal is weak, as the phone might increase its power to make up for it. Keep in mind that texting and video calls let you hold your phone further away from your body. Don’t keep your phone in your pocket; instead, keep it in a bag when you need to carry it around. You should also avoid sleeping with your cell phone close to your head. Learn more about the dangers of EMFs and cell phones at Radiation.news. The Poetry of Sleep – by a master! 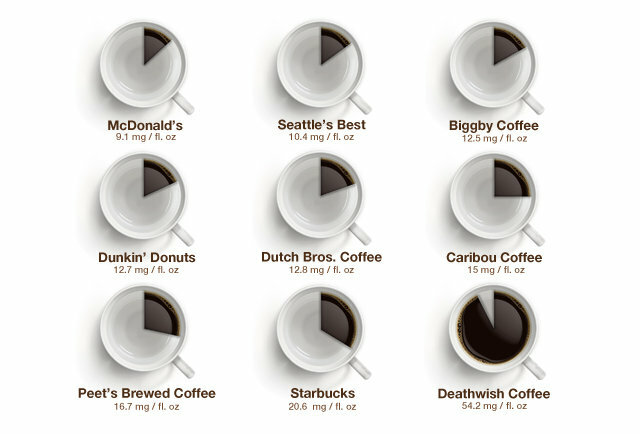 How much caffeine in your coffee?